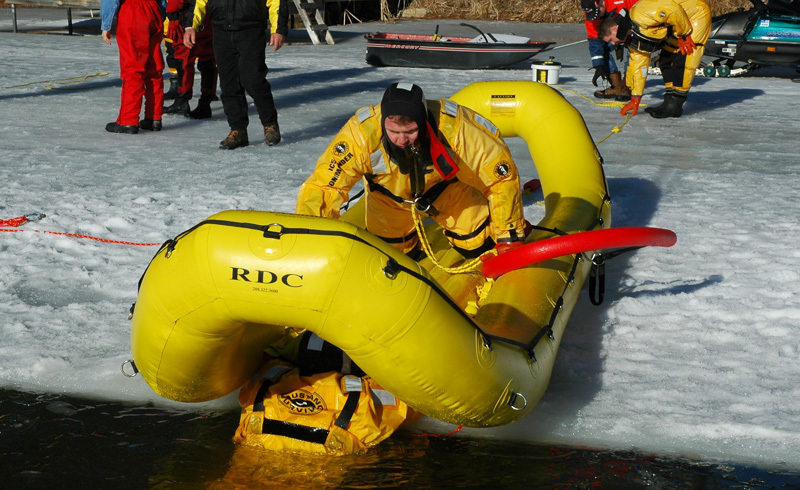 Browse our video gallery of RDC rescue operations. Standard pricing to meet any department's budget. The Rapid Deployment Craft is simply the best, fast-response, ice rescue craft available at any price. The craft surrounds one or more rescuers in an ultra buoyant and protective inflated perimeter. The RDC is easy to control, very stable and is self righting in potential overturn situations. 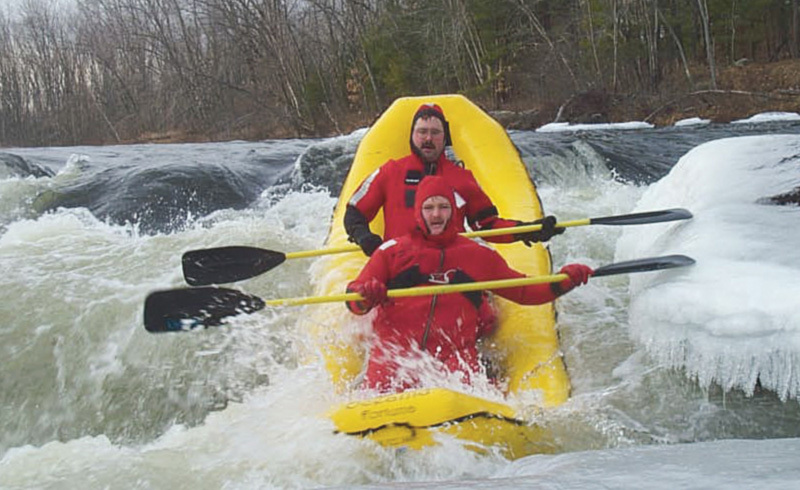 It paddles and ferries like a canoe and is suitable for class or grade 5 whitewater. The RDC tows and tracks well on water and is easier to pull than hard hull rescue sleds or rescue platforms. The RDC tows equally well behind a snowmobile when used for patient transport or equipment hauling. The RDC is designed to withstand severe use conditions for many years. 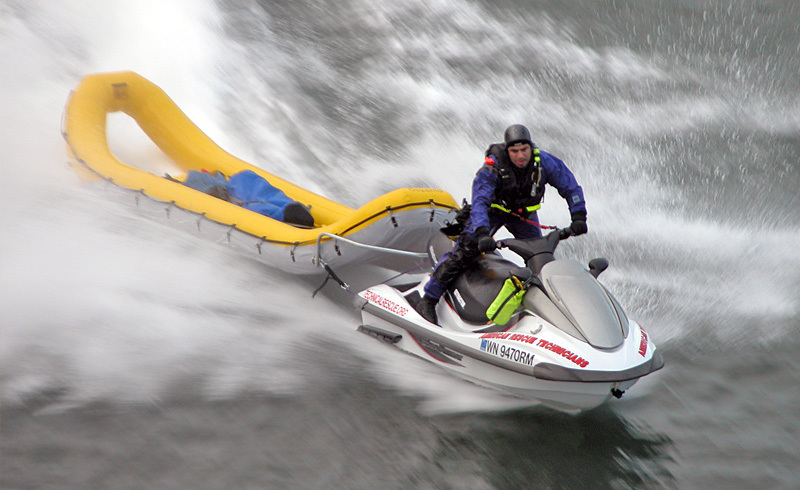 To achieve this, each rescue craft is assembled with the finest, most advanced materials available using the best time tested construction techniques. The RDC fabric is the most durable in the Industry. It is a PU/PVC/polyester alloy material with all the seams being welded and taped for ultimate strength and air retention. No glue or adhesive is used so our seams attain the same strength as the fabric which means there are no weak links in our rescue boats. The urethane coating also contains more UV inhibitors than any other material on the market. This allows prolonged sun exposure with no fabric degradation, as occurs with traditional rubber boats. Our floor is also very special. It is an I-Beam Design that, with very little air pressure, can become rock hard. This enhances stability and makes the RDC an excellent litter for carrying an incapacitated victim. The RDC is one tough cookie. It may last so long that you will forget all about us. That is our goal and our greatest complement. When you receive a rescue boat from us the care and feeding instructions will be incredibly short. Store the RDC deflated and bagged. 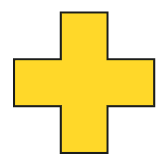 This will give you fast access, less chance of damage and will lengthen the life of the rescue boat. Keep it in a dry area, out of direct sunlight. We understand the conditions that exist with our customers and believe that with a little care, most will have the RDC in service for many safe and productive years. Under ‘normal’ emergency response use, we believe that the rescue boat can last a decade or more. For more information, see RDC Handling and Use Instructions.